The slimmest most unobtrusive trail cam ever developed for use in the harshest environments. Only 1.6” thick and slightly contoured to fit snug against any mounting surface, this may be the most stealthy surveillance camera ever developed… yet remaining fully weatherproof (IP54). With the DTC 450 Trail Cam, you no longer have to feel like you are hanging a car battery on the side of a tree when mounting your game camera. The DTC 450 is the thinnest surveillance camera not just in the MINOX line…but any trail camera line. The world has become a much busier place. MINOX Wildlife Cameras slow it down so you can enjoy the view. Using the most advanced and innovative technologies, our “trail cams,” can take photos or video…day or night…for months on end. We incorporate ultra-fast shutter triggers, IR-Blackflash capabilities that are invisible to most animals, password protected and user-friendly activation menus and we secure this technology in robust, weatherproof, unobtrusive housings that will stand up to years of use in the harshest environments. Hunters and wildlife researchers today can’t afford to waste time in areas that their target species are absent. That is why “trail cams,” can make the difference in finding what you are looking for…or not. With MINOX’s advanced processors integrated into our “trail cams,” you can set trigger delays or find out what “moon phase and temperature,” was present when a photo or video was recorded. You can even hear what that grunt, bleat or growl sounded like! 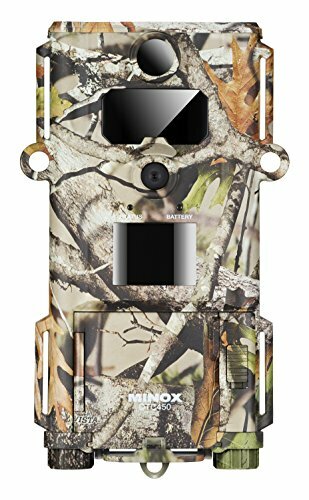 MINOX Wildlife Cameras….revealing nature’s hidden treasures. If you have any questions about this product by MINOX, contact us by completing and submitting the form below. If you are looking for a specif part number, please include it with your message.